In my academic and activist work I often used “militarism” as a negative term. As a concept which describe things na ti ya-hu, or that I don’t like, or that I would actively like to see less of in the world. Lao gi minagahet, the term, the processes it describes are not inherently wrong. The term “militarism” is meant to describe a way of bringing into being aspect of a conversation all societies have, the key points of which deal with security, fear, love, peace, borders and other things which are fundamentally about trust and violence. Kada na kuminidat taotao debi di ha faisen maisa gui’, each community of people asks itself the same questions, what will be the nature of our “defense,” And furthermore, what will be the nature of their “offense” to certain contexts, to crimes, to attacks, to threats or just to mina’a’nao, or general fear? Militarism is a part of that debate that manifests usually as responses which lean towards violence, fear, offense, death and so on. Hafa para ta cho’gue put este ni’ muna’espapanta hit? Kao para ta hatme este? Kao guaha otro chalan, otro inayek? Taimanu na para ta trata i manenimigu-ta siha? Every society creates ways of defending itself, and every society has a conversation about how best to do that. What their values are and whether or not said militarism reflects their values or is counter to them. Even in places without an active or massive military, militarism is still present and could be present in terms of how one sees themselves in relation to another who acts as if they are their protector, or simply how a place sees the best way to respond to conflict. Today the United States has the largest military in the world and a clearly imperial consciousness, where Presidents, Senators and common folk on the streets all feel that the United States has the right to intervene and determine the lives of people in every corner of the globe. Gof tahdong i “militarism” gi tano’ Amerikanu, sa’ hinasson-niha na manggaipodet siha na sina manentalo’ gi lina’la yan tano’ todu i taotaogues gi hilo’ tano’. It is correct political commonsense that no one gets to the highest levels of power in the United States or in just about every other country by being critical or overly critical of the military. People may say that you hate the troops and try to twist things until you look like some pinko-commie, but few politicians actually have troop hating as part of their platforms or in their campaign material. Ti hu gof komprende ayu, lao fihu hu huhungok ayu. Meggai na manconservatives ilek-niha na Si Obama ha chatli’e’ i sindalu siha pat i “troops.” Lao anggen un atan i che’cho’-na yan ekungok i sinangan-na, sen ti magahet enao. Sen ti chumilong enao na hinasso yan i minagahet. But this reflects how all Americans draw some primal identity from the existence of the military, that even if you loathe it, both it’s existence and society at large demands a pound of your discursive flesh. You cannot ever REALLY be against the military. It is one of those traps which is built into the floor upon which you stand. You are never supposed to challenge it or question it, since the very act of doing so could remove the ground from beneath you, leaving you to tumble into some unknown amorphous void without backup. Sina ta li’e’ este lokkue’ gi i palabra “kilisyanu.” Para meggai na Chamorro ma usa este ti para “i gaihinengge gi as Yu’us,” lao para todu i taotao siha. Lao esta gaige gi halom i palabra i pine’lo put todu i manmagahet na taotao siha manggaihinengge gi as Yu’us,” Parehu gi este lokkue’. Todu i manmaolek na taotao, debi di u ma sapopotte i sindalu siha. This is reflected in the way in which we are supposed to agree or disagree, debate and detract in politics, but the men and women serving in uniform should be left out of this. The implied meaning of course, that even if you disagree or hate them, the troops fight to give you the right to speak, so therefore you should shut up and not attack the hand that is fighting off Al Qaeda to protect you. In politics Dennis Kucinich has long represented that the closest thing to an opposing view, but his more peace orientated vision is still tied to that conversation over militarism and militarization. As a member of Congress and a candidate for President, Kucinich proposed a Department of Peace in addition to the Department of Defense. Let us pray that we have the courage and the will as a people and as a nation to shore ourselves up, to reclaim from the ruins of September 11th our democratic traditions. Let us declare our love for democracy. Let us declare our intent for peace. Let us work to make nonviolence an organizing principle in our own society. Let us recommit ourselves to the slow and painstaking work of statecraft, which sees peace, not war as being inevitable. That is the vision which the proposal to create a Department of Peace envisions. What Kucinich is proposing is a different response to the same issue. You have the Department of Defense, formerly known as the War Department, which deals with foreign military threats and also acts as a means of projecting US interests around the world. The Department of Peace would deal with the same problem, but from a different perspective on the conversation on militarization. A Department of Peace would not be a flower shop with hippies flying around the world handing out flowers and telling everyone we love them. Instead it would be a counter to the way people perceive America as usually acting, unilaterally, with force in its own interests. The Department of Peace would still tangle with the “enemies” of the US, but would hopefully deal with them in different possibly less violent or forceful ways. One of the reasons that I am cautious about outright condemning of concepts like militarism or the social, political and economic edifices it creates, is because attacking them or naming them doesn’t really do very much. If you call militarism negative it doesn’t make that conversation go away. It doesn’t make the tendencies that people live by and thus assume to defend themselves by (or accept themselves to be defended by) disappear. For me, it is more important to try to address the pillars of that conversation, and see if people can be changed at that level, in the very stew upon which they articulate their frightened identities and their fear of instability, loss and being the victim of Othering violence. In a place such as Guam which lives in fear of being overwhelmed by American numerous “enemies” in the Asia-Pacific region, attacking the military doesn’t actually alleviate this fear, because the attachment is by definition unnatural, something which exists because it simply can’t find anything better to latch onto. Guam, because of its location and history will for the near future almost always feel awash in fear and loathing, and so its understanding and expectation of militarism and militarization is always skewed stronger than most. Guini giya Guahan, sesso masagan na “fina’militat” pat militarization, ayu i che’cho’-ta. Ayu taimanu na ta prueba na magahet na Amerikanu hit guini! People on Guam can accept a level of militarism in their lives, government and culture which a larger community might have trouble with. This could change however should Guam become more self-empowered and self-assured. If it ceased to see itself as surrounded by enemies, and always teetering on the verge of becoming a 3rd world country then Guam might become a place where it is not so eager to militarize and does not see its future as so intimately tied to the US expanding its military power. In conclusion, attacking the military on its face does little, since the hopeless dependency that Guam feels for the US military presence in Guam has very little to do with militarism or militarization. My main problem with militarism is that the conversation becomes too oppressive, it becomes to centralized and tends to soak up all things around it, infecting so much more than it appears to. That a certain form of it, namely support for the existing military, and overfunding of it stands in for all possible conversation about the topic. Militarism eventually becomes a conversation about priorities. Once you have determined what you believe in or how you value life and wish to defend yourself, how much do you then invest in your defense? How much does you defense come to look like offense? How much of your defense deprives other aspects of life so that it can be invigorated? I have mentioned this before on this blog, a comic which was on a neighbor’s door in the grad student offices for many years and it is very apt to mention here as well. 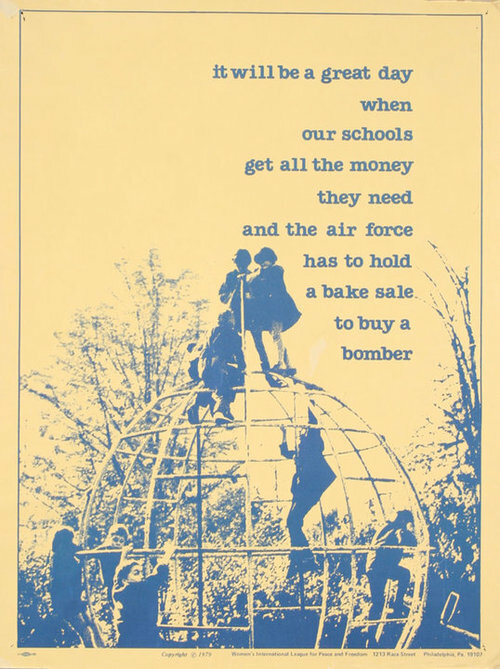 The gist of the comic is that the universal will make sense, when the Department of Defense, the next time it wants to get some high-tech probably useless and wantonly destructive machine, it has to hold a bake sale to obtain it. The message is that schools when they need help with repairs, with new materials, with field trips and with countless other expenses, they have to fundraise and beg parents for help and sometimes hold events like bake sales. This is one of the problems with militarism, is that it can often skew the resources of a society to overwhelmingly favor the military of a country at the expense of other social needs. The Department of Defense receives by far the largest portion of the US Federal budget, and instead of having a constant, open and necessary conversation about that, it is usually accepted that the military should receive as much as it wants or as much as it can. Militarism and the conversation that it stems from will always be there, but that does not mean that the defense policy or the nature of its military should always be protected or always keep the form it appears to have. Does the United States need the massive military force that it has at present? Especially if sustained that force requires that so many domestic issues get ignored or scapegoated onto populations which you can easily blame financial or social ills on? Militarism by it’s nature creates self-contained and insulated institutions. Things which are so frustratingly difficult to change because the very act of critiquing them is considered by most to be stepping over the line or going too far. Tags: Bake Sale, democracy, DoD, Ideology, Kucinich, militarism, Militarization, Ohio, Pas, Peace, Pentagon, Prayer, The Troops, Tinaitai, values. Bookmark the permalink.